You can drop pop culture references all day long and to say you’re a well-read student of literature is an understatement. 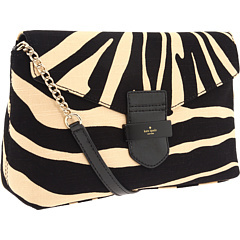 But when the weekend arrives, there’s nothing like cutting loose and rocking some forward-thinking style with the Kate Spade New York™ A La Vita Fabric Rory Zebra bag. Made of slubby woven cotton with patent cowhide trim. Holds your wallet, keys, sunglasses, lipstick, and smartphone. Top handle with chain accents. Top envelope flap with tab closure. Custom woven solid faille interior lining with a back-wall zip pocket and front-wall slip pockets.